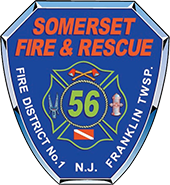 At approximately 19:47 hours Station 26 and 56 were dispatched to a car into a building at 80 Cottontail Lane, Somerset. Upon the arrival of the the first fire units, it was determined that the exterior facade and window assemblies of the building were compromised. This condition prohibited the vehicle from being removed safely without emergency shoring. Deputy Chief Scott (Car 26-2) assumed command of the incident. Chief Sudo (Car 56) took over incident operations. Car 56-2 (DC. Gardner), R-56, E56-2, U56 w/ Technical Rescue Trailer 56, L-26 and other support units inserted emergency shoring to support the damaged area so the vehicle could be removed. The operation lasted approximately 2 hours, there were no reported serious injuries. Somerset Fire & Rescue Co. No. 1 takes home Best appearing Rescue and Special Service apparatus trophies. Great work by all the members who helped get the rigs ready for the parade!